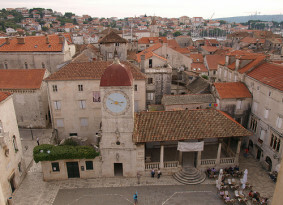 Trogir has 2300 years of continuous urban tradition. 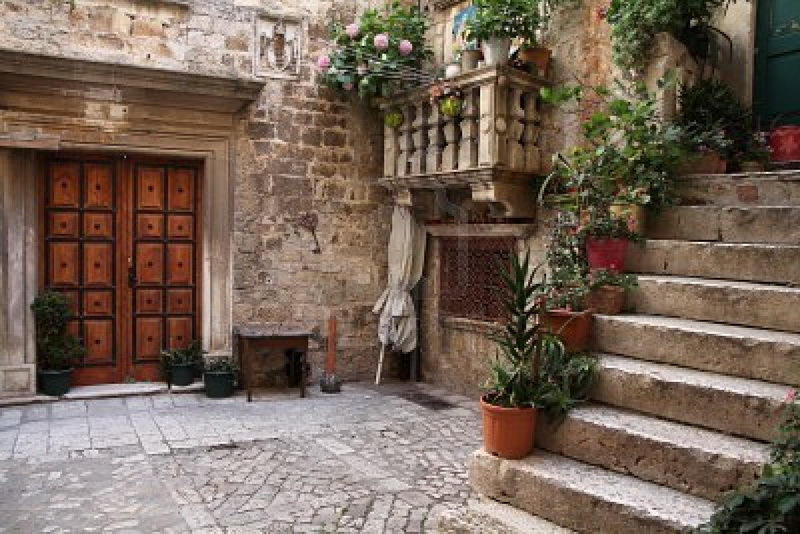 Its culture was created under the influence of the ancient Greeks, and then the Romans, and Venetians. 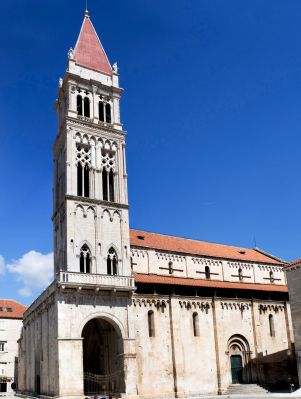 Trogir has a high concentration of palaces, churches, and towers, as well as a fortress on a small island, and in 1997 was inscribed in the UNESCO World Heritage List. 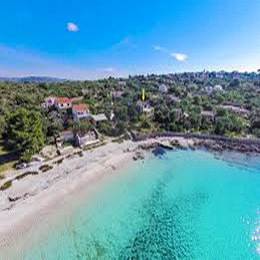 In the 3rd century BC Tragurion was founded by Greek colonists from the island of Vis (Issa) and it developed into a major port until the Roman period. The name comes from the Greek “tragos” (male goat). The sudden prosperity of Salona deprived Trogir of its importance. During the migration of Slavs the citizens of the destroyed Salona escaped to Trogir. 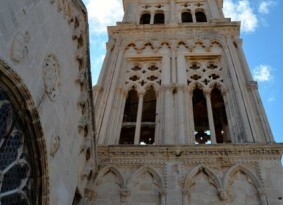 From the 9th century on, Trogir paid tribute to Croatian rulers. 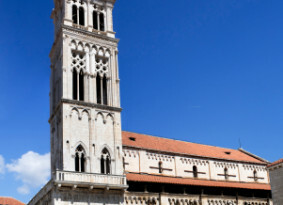 The diocese of Trogir was established in the 11th century (abolished in 1828; it is now part of the Roman Catholic Archdiocese of Split-Makarska) and in 1107 it was chartered by the Hungarian-Croatian king Coloman, gaining thus its autonomy as a town. 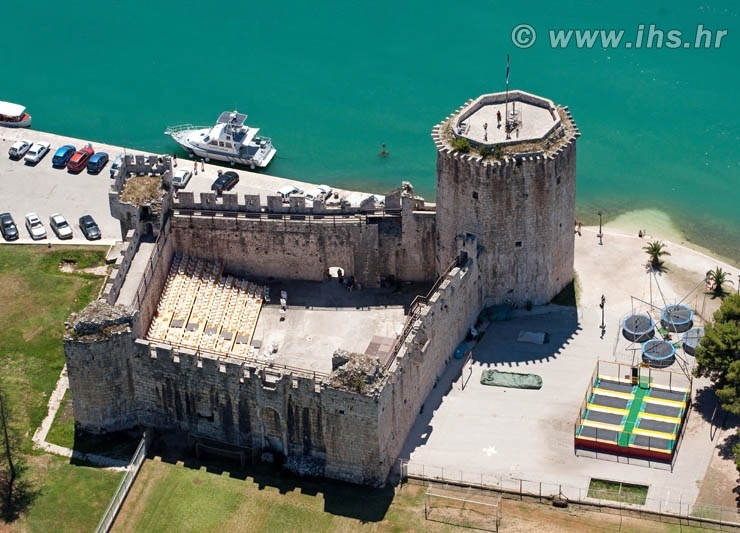 In 1123 Trogir was conquered and almost completely demolished by the Saracens. 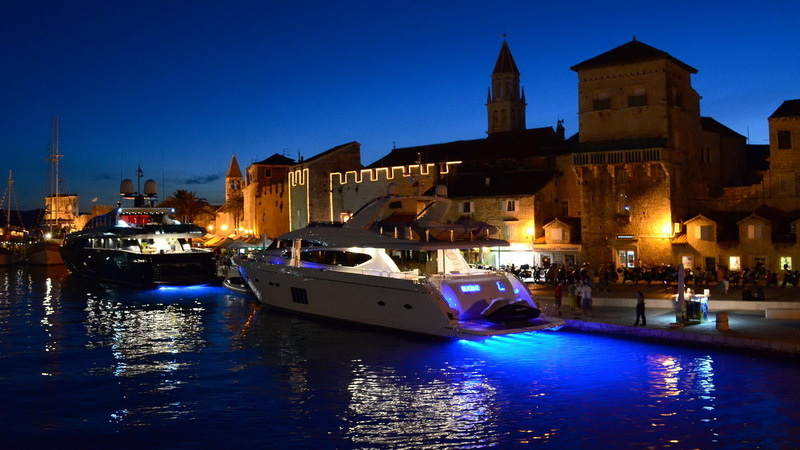 However, Trogir recovered in a short period to experience powerful economic prosperity in the 12th and the 13th centuries. In 1242 King Bela IV found refuge there as he fled the Mongols. 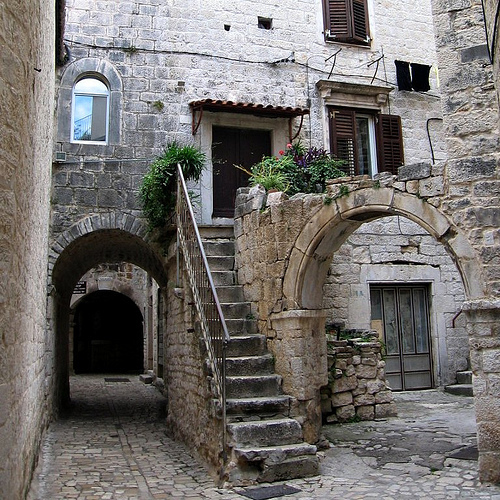 In the 13th and the 14th centuries, members of the Šubić family were most frequently elected dukes by the citizens of Trogir. 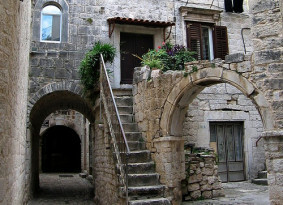 In Dalmatia, the city was known as Tragur. 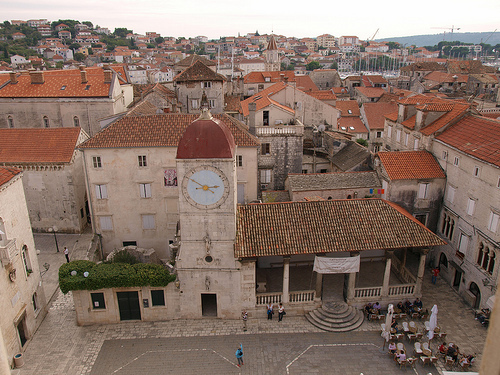 After the War of Chioggia between Genova and Venice, on 14 March 1381 Chioggia concluded an alliance with Zadar and Trogir against Venice, and finally Chioggia became better protected by Venice in 1412, because Šibenik then became the seat of the main customs office and the seat of the salt consumers office with a monopoly on the salt trade in Chioggia and on the whole Adriatic Sea. In 1420 began the period of a long-term Venetian rule. 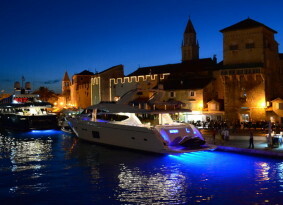 On the fall of Venice in 1797, Trogir became a part of the Habsburg Empire which ruled over the city until 1918, with the exception of French occupation from 1806 to 1814. 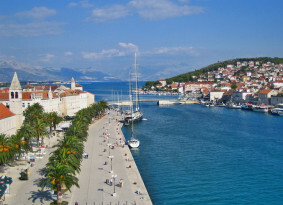 After World War I, Trogir, together with Croatia, became a part of the State of Slovenes, Croats and Serbs and subsequently, the Kingdom of Yugoslavia. During World War II, Trogir was occupied by Italy and subsequently liberated in 1944. 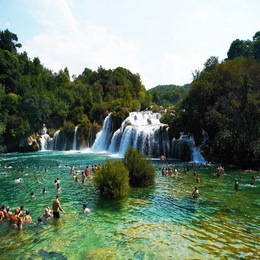 Since then it belonged to the second Yugoslavia, and from 1991 to Croatia. 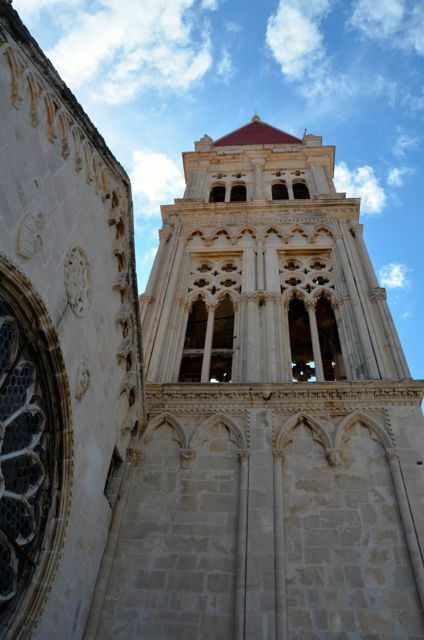 Trogir is the best-preserved Romanesque-Gothic complex not only in the Adriatic, but in all of Central Europe. That is one of the reasons it is becoming more famous in the world, but not the only one. There are many more things to see and do in this area. 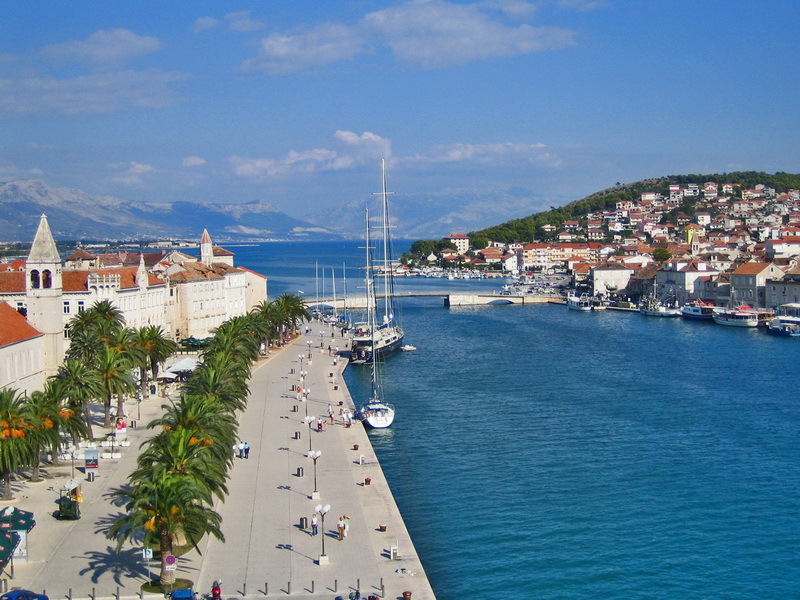 Trogir is really a place of relaxation, breathtaking views and new experiences. 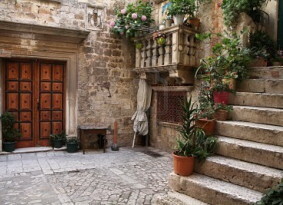 As opposed to many peoples opinions people are still living in the old center and there are many apartments in the center and since it’s UNESCO protected they are very authentic which means you will get the real feeling of the old town. Most of the monuments are situated in the city center but there are also many places that are not advertised. We will tell you where they are and help you find them. You can take a guided tour there and learn all about the history and the most important places or you can also take a walk on your own. The town is very small, so I would advise you to try to get lost. It is absolutely impossible to do that but you will see many interesting things. In town on the main square you can see domestic music where a famous local ‘klapa’ i singing the whole day. You can climb up the belfry of the cathedral and see the whole city. Also, you can get up the fortress of Kamerlengo an see the inside of the construction. For fun there are many bars that offer a variety of music domestic and foreign. There are many beaches that you can go to and have a fun time on the beach. To those that are a bit far away to walk you can take a boat that goes regularly and is really cheap. 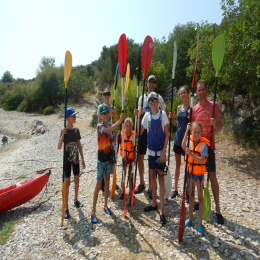 It goes to Arbanija, Okrug, Slatine and Seget. 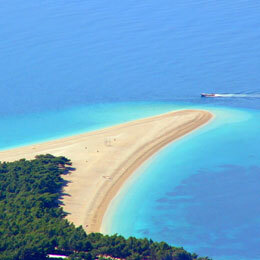 The biggest beach on the island is in Okrug Gornji where there are often night partys and concerts. 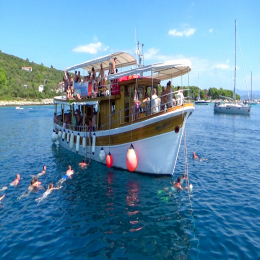 In Trogir area there are often fisherman party’s in the summer with good food and music, but there are often not advertised so ask a local or us when the next one is taking place. 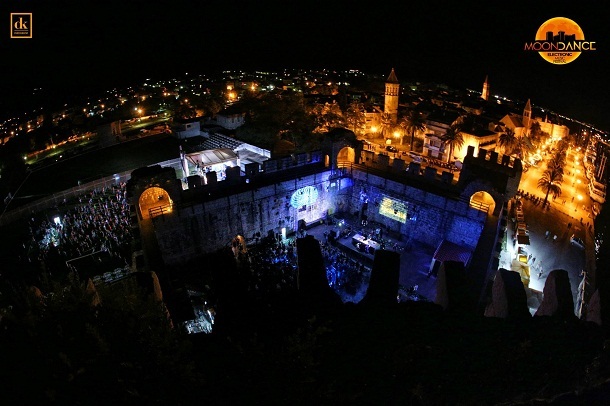 For those who like to party there is also a festival ”Moon dance” taking place in the old fortress Kamerlengo every year in summer. 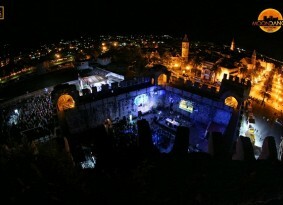 It is a party that lasts 3 days with techno, house and other music. Just 3km to the west there is village Seget. It’s just a 20 minutes walk or 15 minutes with taxi boat from city center. It is also a recreational center for the city. It is also the setting for numerous beaches and jogging trails as well as tennis courts and walking paths, all surrounded by the scenic forest.